Hi, welcome to Fallingbrook, and welcome to Deputy Donut! I love donuts and coffee, and so does my father-in-law. Tom is that guy back there in the kitchen lifting another basket of yummy fritters out of the fryer. Tom and I opened Deputy Donut after I burned out as a 911 operator and he retired from the Fallingbrook police department, where he was chief. Why did we call the shop Deputy Donut? It has a lot to do with the police officers whose headquarters are up the street and who threatened to arrest me (not seriously) if I didn't open a cafe where they could enjoy their breaks--and the donuts and coffee they'd sampled at parties I'd catered. Don't tell those cops, but the shop is actually named after my cat. She's a tortoiseshell tabby, otherwise known as a torbie. Like some other tabbies, she has donut-shaped circles on her sides. She's spunky, cuddly, and talkative. Most of the time, I shorten her name to Dep. She does comes to work with me, but the picture on our brochure is misleading. Due to health regulations, Dep is not allowed in the kitchen or here in the dining and sales area. She stays back there in Tom's and my office. You can see her now, blinking at us from the windowsill, and you can probably tell that her room has windows on all four sides, so she can supervise her entire realm. You might notice the kitty staircase and carpeted "tree." They lead up to a catwalk above the windows. She likes to go up there and drop catnip mice on our heads or our keyboard.. She has everything she needs in her kitty playground, and Tom and I check on her often. At night, she goes home with me. Oops, gotta go. The Knitpickers, six women who spend nearly every weekday morning knitting and gossiping over coffee and donuts, are settling in at their favorite table. Enjoy your cappuccino and fritters! 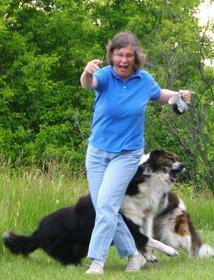 Ginger Bolton is also known as Janet Bolin, servant of rascally pets and author of the Threadville Mysteries. 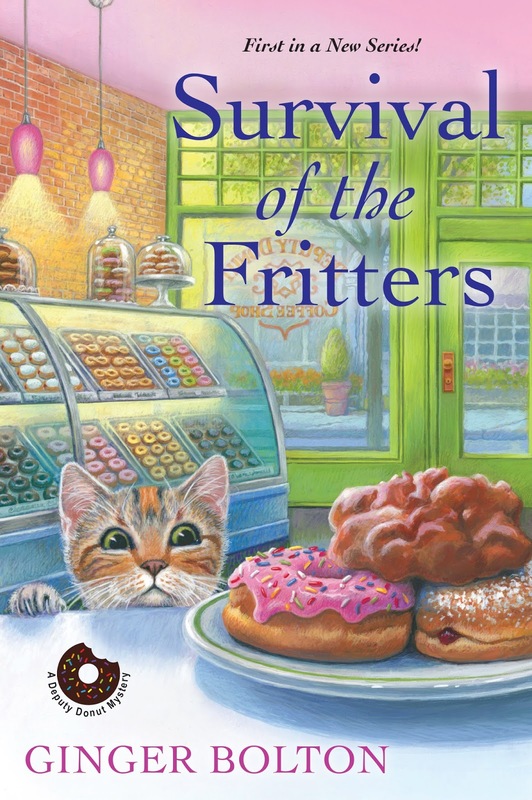 SURVIVAL OF THE FRITTERS will be in stores in February, 2018. Congratulations on the new series, Janet and Ginger! Looks like a great new series. I can't wait to read it! Really looking forward to this one! Donuts and coffee...how can that go wrong? Nothing ever goes wrong in a murder mystery. What do you mean, murder mystery? You're scaring me. This sounds great! Like the cover, including the cat! Looks like a winner! Thank you! Kensington, the publisher, did a super job on that cover. I like the excerpt, so I'm hoping my local library will carry it. Fortunately, most libraries will order a book when we request one, or borrow it from interlibrary loan. Yay, libraries! I am anxiously waiting for this new series. If the story in between the cover is as eye-catching as the cover, I know it will be a wonderful book to read. Thank you, Robin. I was thrilled when my editor sent me the photo of that cover! Looks like another series that I want to read. This looks great! I will add it to my To Be Read list! Thank you, Susi. I hope you'll enjoy it! I love food related cozies and I wish that I didn't have to wait so long to read. But I am sure this will be a fantastic series. Congratulations. Oooh a new series by an author I enjoy reading. Now I just have to check the data base of two separate county libraries to see if one of them ordered the book. Thank you, Nora A, and for being such a great fan. It's probably too early for libraries to order the book, but keep an eye on my website and/or facebook pages. When booksellers start pre-sales, maybe libraries will start ordering? And if your local libraries haven't, feel free to nudge them . It is hard to wait. It's already written, and I've started writing the second book in the series. Oh my goodness.....just love, love, love the awesome cover of your new book here dear Ginger. Do I really have to wait another whole year to read it? 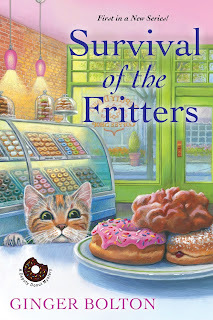 I can just tell by the cute cover that this is going to be a super duper awesome book!!!! Can't wait to read it!!! I love mysteries with cats, and yours sounds so exciting! Guess I will just have to be patient and wait a year....darn! God bless you!!! Thank you, Beverly. I love the cover, too. I hope you'll like the book! Writing it was fun. I couldn't find the book on Amazon. Then I looked again and realized it will be February next year before I can read the book. It sounds like a great new series. Thank you, Lynnette. It is a little early for it to appear on Amazon.